The KSM1FPA food processor attachment can be used with any KitchenAid mixer to slice, shred, and julienne fruit and vegetables. An ExactSlice™ lever gives you fine-tuned control over the thickness of the products you're processing, while the extra-wide feed tube lets you process thicker items with ease. This food processor attachment is designed for easy cleanup. 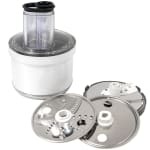 Food processor attachment for stand mixer KSM150PS INCLUDES SLICING DISC, SHREDDING DISC, JULIENNE DISC.